We let our quality work & commitment to customer satisfaction be our slogan. Langenfeld Masonry & Concrete has been providing high-caliber concrete pouring and paving, as well as masonry and brickwork services to Racine, Kenosha and South Milwaukee counties since 1912! In addition, we also offer basement waterproofing, foundation pouring, repair and more. We’re the best at what we do, with a long history of completed projects and satisfied customers to prove it! We’re a 5th generation company with more than 38 years of current experience to provide to our customers! Much of our work comes from referrals and we’re proud to boast a customer satisfaction rate of 99%! Our staff consists of experts who can provide you with answers to any questions you might have about your masonry or paving project. Our business is fully licensed, bonded and insured for your protection and peace of mind. We always offer free estimates and all our work is warrantied. We also offer $200 off driveways, patios and flatwork of $1,500 or more. Few businesses can say they’ve been masters of their craft for 5 generations. At Langenfeld Masonry & Concrete, we can! In fact, we’ve spent the last 100 years building our skills and expertise, along with our reputation as the very best masonry contractor in Racine, WI. Throughout the years we’ve tackled projects big and small—everything from simple flatwork, to large-scale commercial masonry, to foundation repair and more. Our ability to approach any project, assess its needs and execute with precision and quality workmanship has set us apart for more than a century! We specialize in block and retaining walls, as well as any and all flatwork and general masonry projects. Residential customers rely on us for driveways, patios, retaining walls and more. Commercial customers look to us for the same, in addition to brick and stone façades. 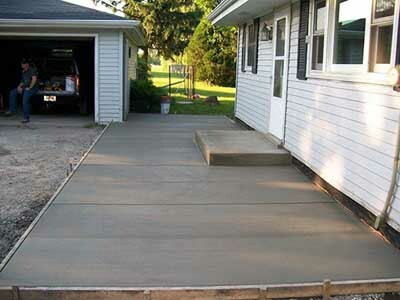 For customers with foundation demands, we’re able to provide everything from paving, to repair, to brand-new concrete foundations in Racine, WI for home additions and expansions. When it comes to bricks, blocks, stone and cement, we’re truly masters of our craft! Contact us with the details of your project and let us show you with 5 generations of honed skill and experience look like when it comes to a quality finished project! Get your driveway paved, block wall built or foundation fixed with the help of Langenfeld Masonry & Concrete! We’re happy to provide you with a scope of work and a quote today.